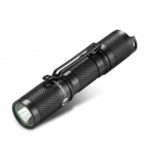 EDC25 is a powerful pocket-sized versatile EDC flashlight which uses one latest Cree XP -L V5 LED producing max 1000 lumens and super long runtime 15 days with moonlight mode (1-lumen). A hidden USB port in the tube makes you can charge the flashlight only with one USB cable conveniently. 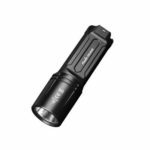 EDC25 has the tactical setting modes except the outdoor modes, switching the tactical modes and outdoor modes conveniently makes EDC25 a excellent Cross-Border flashlight. 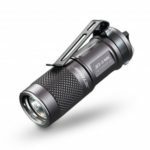 Uses Cree XP-L (V5) LED with a lifespan of 50,000 hours, max 1000 lumens and runtime of 340 hours. Converting tactical and outdoor mode conveniently. Optimized ultra-precise reflector offers a longer beam distance than competing products. Low power LED indicator built in side switch, it flicker faster with lower power; it will automatically change to LOW mode when battery is too low and then gear cannot be changed. Intelligent memory function stores last mode accessed. 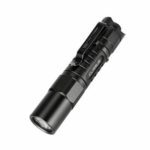 Hidden micro-USB charging port is designed in flashlight tube with charging LED indicator built in (red light- charging now; green light- charged already). Double-side AR coated, tempered window resists impact and thermal shock, maximizes light transmission to 99%. Digitally regulated output maintains constant brightness, no flicker. High strength aerospace aluminum alloy construction with anti-scratching type HAIII military grade hard-anodized finish; consistent silo integrated structure, to ensure the best heat dissipation. 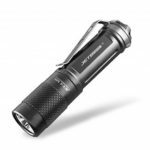 Equipped with quality stainless steel clip, flashlight can be fixed on the belt and easy to carry around. Runs on 1 x 18650 or 2 x CR123A batteries (not included). 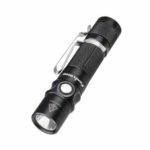 Market applications include, but are not limited to everyday carry, outdoor activities, emergency, security, hardware/tool and many other uses.